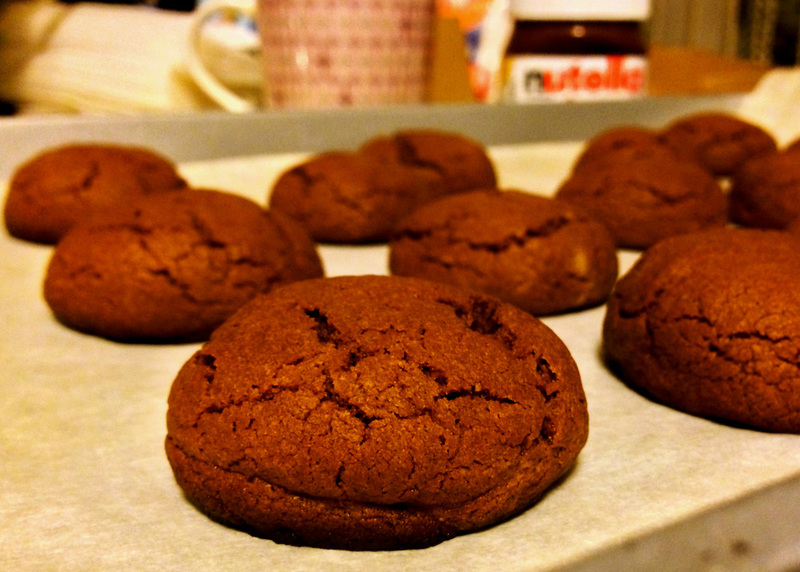 Nutella Sandwich Cookies, adapted from 300 Sandwiches (which was in turn adapted from Our Best Bites) Total time: 30-40 minutes. Yield: around 18 cookies. Beat together 3/4 cup of Nutella, butter, and the egg. Slowly add flour until a sticky dough forms. Roll dough into balls, and place about 2 inches apart on the baking sheet. Bake for less than 10 minutes, waiting until the cookies are puffed but still soft in the center. Remove from oven and cool on baking sheet for 3 minutes. Transfer cookies to cooking rack and let cool completely. This is important, because otherwise they will fall apart when you attempt to cut them. Using a serrated knife, split each cookie in half, and spread each bottom half with some more Nutella. Replace tops and press lightly together. If you are wondering why this cookie recipe counts as a sandwich, direct all questions to Stephanie Smith because I certainly don't know. Although, with the boyfriend she's currently saddled with (in the blog entry accompanying this recipe, her love of Nutella is a "shameful secret" she has to hide from him), I suppose we should cut her some slack and let these deliciously simple sandwich cookies count for points on her ridiculous, yet arduous quest to matrimony.